Nowadays, most of us listen to music on MP3 players, mobile phones, iPods, etc. We try to squeeze in as many songs as possible in order to create a big playlist. But, the storage space remains an issue. If it’s a mobile then we also store several things apart from songs, hence the space isn’t sufficient. To overcome this problem we can compress MP3 files and then later copy them. We may have to sacrifice a little bit of quality in order to get more songs but nevertheless it’s a great idea. MP3 quality modifier is a small yet handy tool for anyone. 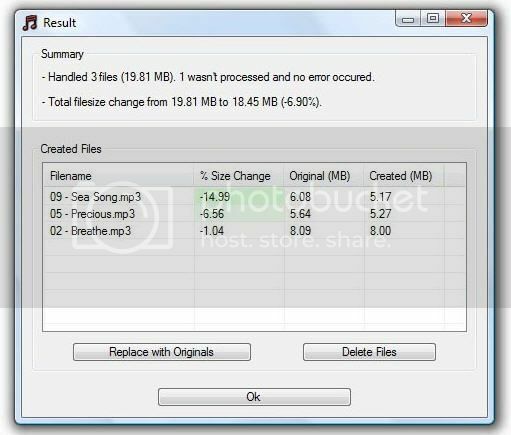 You can easily change the bitrate of your mp3 music collection so that the file size can be dramatically reduced. With this advantage it’s possible to put more music on your mp3-player or just to save some disk space.